I grew up in a journalism family. My dad published a small-town weekly newspaper called The Windsor Beacon, as did his father before him. 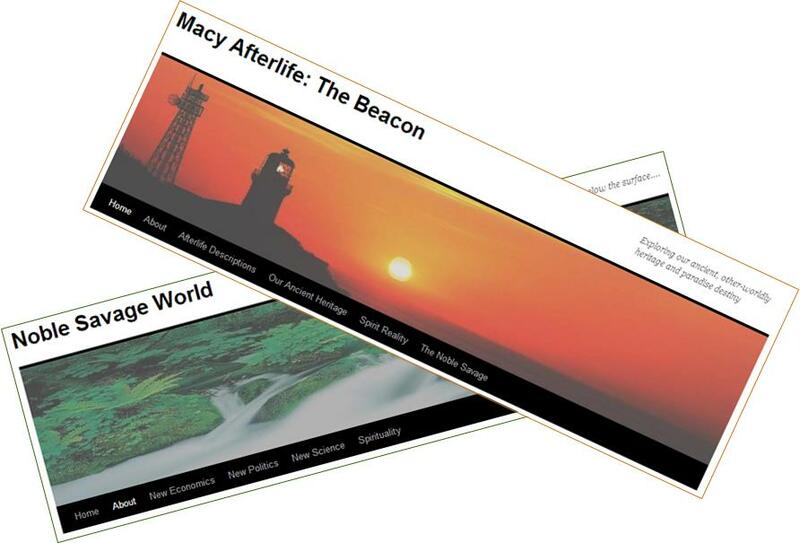 It seems like the “Beacon” was always a part of me… hence the masthead picture for this website. … all to help people live with more consideration and kindness toward each other, and toward the planet and its other species. Thanks to good luck, deep research, and lots of help from around the world and beyond (including from my wise, loving, and supportive wife Regina), I’m getting closer to achieving all those goals as I enter the autumn years. Worldly matters. In the 1980s I worked with leading thinkers from many lands to launch a series of peace anthologies with penetrating views into modern social, political, economic, and scientific systems. Other-worldly matters. Since 1988 (when near-fatal cancer caused me to rethink life and death) I’ve been immersed in a frontier field of research called ITC (instrumental transcommunication), the use of technologies to receive voices, images, and text from the finer worlds of spirit. I helped establish an international ITC panel that was able to sustain communications for a number of years with brilliant minds beyond our world—those who are sometimes called spirits and angels and ethereal beings, and who streamed pure, earth-changing information to us through our technical equipment. My main role in that group, INIT, was to gather up the contacts we received from the other side and to make them available to the public. One main aim of our group, after all, was to help enlighten humanity about our human spiritual heritage with the support and guidance of our spirit friends, especially The Seven ethereal beings whose messages are prominent on this website. After giving hundreds of public presentations, seminars, and radio and TV interviews, and publishing a number of books and journals, I’m now (in 2014) withdrawing from the public eye in order to share the best information from those 35 years of research on two blogs I’ve set up for that purpose. The two sites share some of the same articles that span life and afterlife, including The Human Story collection… but for the most part each site keeps its focus neatly on the appropriate side of the veil. I hope you enjoy this two-pronged journey into human understanding, and join the discussions at the end of many of the articles. Here on Macy Afterlife, the journey includes not just our planetary origins . . .
. . . but also our ancient human heritage . . .
. . . as well as our true spiritual nature . . .
. . . the influence of finer spiritual beings upon our lives . . .
. . . and what really happens to us after we die. The contacts that I share on this site (those related to INIT and my own luminator photos) are based on years of serious research and are legitimate to the very best of my knowledge. They are the product of hard work, love, trust, and good will among colleagues on both sides of the veil. That sums up the challenges of ITC research on Earth. The hormones and egos responsible for the savage side of human nature present a chronic obstacle to the unity and resonance needed to establish and sustain a contact bridge with the finer realms of spirit. Once that obstacle can be overcome (and that will involve a refinement of human nature), ITC will be ready to enter a golden age. Love-based ommunication bridges between Heaven and Earth will open wide. Until then, the contacts received by INIT members during a 6-year window of opportunity (1995-2000) and shared on this macyafterlife site stand as a reliable example of what is possible for our world… under fertile conditions of noble human attitudes. That is one ambitious project……Good luck on your journey,I know I wouldn’t dare…. Just a short note to thank you so very much for all the deep spiritual insights you give us. It’s truly wonderful. I must say I have by chance come across your research. I was reviewing a lecture by John E Mack when he referenced you and your work. My curiosity got the best of me and within ten or so seconds I was on the World ITC webpage. I have two questions which arise in my mind every time I think deeply about this subject. How do you reconcile man’s supposed path of evolution (from ardipithecus to australopithecene to homo) with the evidence presented to you? Also, I’m sure you’re familiar with the research of Michael Newton. He presents a similar (and correct me if I am ignorant) but slightly different spiritual cosmology. How do you reconcile with his techniques and conclusions? Actually I am mistaken I have one more question. What about the conclusions of John E Mack with the extraterrestrial presence? How do they fit into man’s progression? Any response, even the possibility of you reading this, delights me. I am in college right now and try as much as possible to disperse this information to others, but I do not think it is ethical of me to do so until my confusions have been subsided and my thoughts organized. Being this confused and without any answers anymore is slightly frustrating, but I am trying to be patient. I think there’s a fine line between the worlds of spirit and the realms of ETs and UFOs. Both exist in realms of subtle vibration beyond our senses and sciences. Our spirit friends have made reference to various types of extraterresrial beings who move in and out of our world. I suspect the complete evolutionary picture of humanity is like a big jigsaw puzzle, the various links that science has unearthed (australopithicus, neanderthal, hobbit…) are just a few puzzle pieces, and there are many, many more pieces yet to be found. How exactly the complete picture looks, of course… your guess is as good as mine. But I’m fairly certain that natural selection played no larger role in the big picture than did genetic engineering and cross-breeding by superhuman beings who were our distant ancestors. I’m not real familiar with all of Michael Newton’s research. I’m aware, though, that many afterlife researchers have many different views of the afterlife. I think it’s just a matter of the spiritual realms and parallel physical realms being far too complicated for us to grasp with terrestrial patterns of thinking that are based in time, space, and structure. So, naturally, when we humans with our limited understanding view something that complex, we’re bound to draw different conclusions as we try to reconcile the mysteries with our limited knowledge. There seems to be a fine line between spirit and extraterrestrial. In my view, spirits, ETs and ‘legitimate’ UFOs all are able to move into and through our physical dimension and then exit into subtler dimensions… some of which are parallel material universes (in the case of ETs), and others of which are spiritual domains (inhabited by astral beings, ethereal beings, and so on). I suspect that some of those ETs are involved in the on-going genetic refinements of humanity that (I believe) are aimed at adjusting our ‘noble-savage’ nature more and more toward the noble side… as we humans are able to civilize the world into a less savage place… so that our fears, animosities, greed, and other savage emotions become less and less necessary for our survival. Is there anything you can tell me about a thought/mind bridge. Many thanks. Here are links to some of the articles about the contact field (thought/mind bridge) that facilitates contact with the finer realms of spirit. Let me know if it has the information you’re looking for. If not, plz be more specific. Thank you for the links. I heard the term via evp and was wondering what exactly it meant. Mandy, EVP (electronic voice phenomenon) is the precursor to ITC (instrumental transcommunication). EVP involves getting short, faint voices on a recording medium, like a tape recorder or digital voice recorder. ITC involves an open channel through which spirit can deliver long texts, images, and dialog through the electromagnetic energies of our technical equipment. I’d like to make contact with you regarding an article for New Dawn magazine on the spirit faces phenomenon. Appreciate if you can drop me an email. David, I’d be happy to write an article for your magazine. I’ll be in touch by email to get details. I had mailed you a few days ago on our extreme interest in the activities of WorldITC and the findings and also summarizing our material and purpose in this field. This was mailed to you on your mail ID on the WorldITC site. I am not too sure the mail has reached you or if you have discontinued using the worlditc mail id. We would like to make contact with you on the subject and would greatly appreciate if you could send a mail to me. I’m happy you’ve made contact with me. Your earlier email to me I did not receive, sorry to say. and I think you do noble and important work. I have contacted you before with questions and appreciated your responses. Your research and ideas are groundbreaking. The implications of some of your exploratory research defy so many of our conceptions and shed light upon some very controversial philosophical arguments. For instance, I am very interested in how your research adds to our understanding of the concept of time. On the banksides of the river of life you have reported that people have been observed living in the style of present and past peoples from Earth, but not in the style of potential future people. To me, this indicates that the future does not exist yet. There’s many possible realities the concept of time could be….past, present, future existing at once, only the present moment existing etc.. From your research it seems to point toward time moving forward, with the future not in existence yet. It also implies that in the other dimensions time is somewhat synchronized with our time in the sense they are both moving forward at the same time. My other question, a little unrelated, is why do people seem to always to appear in their last past life form out of all of their possible endless existences? If your earthside personality is derived from your current life’s past, where youre born, your intelligence, your disposition, your economic class…I guess what I’m trying to say is do our lives on earth create this astral personality or does the earth personality emerge from our spiritual disposition? and if the latter is true, how is this possible? Sorry for the hundred questions. Your research is a constant influence on my thought, but raises a lot more questions than answers. Great questions, Cody. Our spirit friends have talked about ‘fields of possibility’ when addressing the future. Timelines forward from the present apparently can branch in various ways… and sometimes DO branch in more than one direction, spinning off into parallel worlds that continue to exist and advance simultaneously. Not an easy reality to grasp with our worldly minds! Regarding multiple lifetimes of the same soul… one of our spirit friends related his experience, after getting settled in on the other side, of being accompanied to a hall, and a glass-like chamber… similar to what you might see on Star Trek. As he observed the scene unfolding in the chamber, he saw a “Fugger” (a 17th-Century European banker) riding in a carriage. As he became engrossed in the scene, feeling an unavoidable pull, he was warned by his friends to detach emotionally from the scene. He’d been that banker in another lifetime, and he could easily be “pulled in” to the scene, losing his current ‘self’ (as the late father of one of the ITC researchers). So, that’ll give you an idea of reincarnation and its effects on us after we die. I know it doesn’t provide the complete answer… but the more I learn about these things, the more questions I find that need to be answered. It seems we won’t know the full truth until we leave this world of limited understanding, get settled in on the other side, and then begin a new journey of spiritual ascendancy… moving ever inward through subtler illusions toward the truth. Good luck with your seeking! There is something I would add to this, and that is: Tell the people who are important in your life how much they mean to you, and why you value them. It is so easy to forget to let those closest to us know how much we appreciate their presence, their wise counsel, and the things they do for us, big and small. Tell them while they are still here with you, sharing your life. I think this also helps.
. . . .I bought your CD, Bridges to Paradise made in cooperation with the Monroe Institute with their Hemi-Sync frequencies integrated, at your talk at the Theosophical Society in Wheaton, Illinois. I like it. Is it a consistent focus 10 throughout? Any special frequencies included? I ask because parts of it are really deep. That’s good! But my other focus 10 CD’s (also products of the Monroe Institute) are not so deep, and I was wondering. The Bridge to Paradise CD (in the heart meditation segment) uses the same frequencies as TMI’s popular Heart-Sync CD, which I believe is Focus 18, but I’m not sure. I agree: it takes you to a deeper, more peaceful place than their usual Focus 10… which is also used on Bridge to Paradise, during the journey to the paradise afterlife. Hm, the question about persistence in EVP/ITC experiments is a little harder. You pretty much have to follow your feelings on that. Here’s what I know from my research: Some people are born with a psychospiritual aptitude that facilitates ITC contacts. “Things just happen” in their presence… anomalies with electrical equipment. Some people gain this aptitude after a near-death experience. I suspect that anyone can foster that aptitude to some degree by fostering psychospiritual purity through meditation… but I’m not so sure that they can ever really excel at it. I know that continued EVP/ITC experiments gradually attract a spirit group around the experimenter, and the developing rapport sometimes leads to louder, clearer voices and better communications. Beyond all of that, each person can choose how intently he or she wants to pursue the experiments. I’d always recommend focusing on ethereal beings (angels) and inviting their support and help. They can help to raise your spiritual vibration and attract a finer group of spirits to come into your spirit group. We have some good ideas on our http://www.worlditc.org website; click on “Tips for Experimenters” on the left of the homepage. Hi, Mark, I’m not sure if I putting this ‘comment’, which is really not a comment, in the right place, so please forgive me. Reveal your 5-15 top blog picks and let them know by leaving a comment on their blog (I have only five picks). * Copy and paste the award on your blog. This is an opportunity to share our knowledge of other blogs . . . although it is not required. Congratulations and best wishes! Thanks for all you are doing. I’m sure we’ll be in good company with this… so MANY good blogs out there. Dear Mark You know we love your work. Making available such research from Timestream is one of the sources I have found to be clear and accurate. Your writing as ever is engaging and wonderful. Keep it up! Sincere wishes from Bill and Deb as we get ready to move from Australia to New Zealand to further our alternative spiritual work. Best wishes from us and beyond. You are loved. Thanks, Bill and Deb, very much appreciated. Wishing you a happy holiday season and a spiritually rewarding life in New Zealand… which Regina and I have not yet visited but have heard only wonderful things about. Is there a site where I can see the sort of alternative spiritual work you’re involved in? i sense a resonance…. Bill and Deb, I think this is yours…? I realize you’re engaged in other activities of a spiritual nature however, have you completely abandoned research in ITC? I no longer experiment, but I continue ITC research in the area of writing, studying (past contacts), and exploring future possibilities. The contact field hasn’t accommodated exceptional contacts for the past decade or so. I’m hoping that changes in the coming years. I can appreciate your position but out of curiosity, how will you know if contact can be established if you don’t try? Do you still try to check-in from time to time? June, I’m always open to new ITC breakthroughs. I “keep on top of it” mostly through my dreams and meditations. Intuitively I’ll know when a reawakening starts to happen. I have only skimmed the content of this web site having become aware of it from a comment made in an Interview I was listening to. I struggle with the ideas surrounding this Earthly existence. I had some lengthy discourses a number of years ago with some Guides, via a channel. They described this world as a rehabilitation Planet. My purpose here was to expand in consiousness. So, if this is true, why try and change things on this planet? The Ego, and all it’s ugliness and tendency for destructive activity is precisely what makes this place such an awfull and yet wonderfull learning environment. It would be like going to a Marine training base, and disassembling all the obsticles and hazards, to make it park like. What good would that be? And really, why are so many people concerned about the other side? We are of that other side! It would be like going to a movie and focusing all ones attention on the projector or other aspects of the movie house. That seems to be the consensus… that Earth life is a soul school of sorts. A place for our finer self to learn and experience. If that’s true, then yes, it would seem a waste of time to try to make things nicer around here. In a nutshell, the light from the source (that manifests everything) grows dim by the time it gets this far removed from center, so there are pockets of chaos and darkness. Souls choose lifetimes on Earth as though enlisting for the front lines of battle, with the aim of eventually spreading the light, love, and wisdom into this dark and troubled realm. I could be wrong about all that, but it’s certainly the scenario that makes the most sense to me. If I’m right, then it’s IMPORTANT to try to make the world a better place during our lifetimes. That’s why we’re here: to spread light from the source out into the furthest reaches. We also have secondary reasons for reincarnating…having to do with karma, mistakes we made in past lifetimes, and so on… but the primary purpose is to spread the light through our thoughts, words, and actions… (imho). Hi Mark, I’d recognize you anywhere. Long time since Denver/Broomfield- huh? I’m finally getting around to looking over your stuff. congratulations on your slight shift into the spiritual and out of the experimental. you are nailing it right on the head as far as I’m concerned. Little did we know way back then… Huh ! If everyone trusted and allowed the truth that you are laying out for us all…..it would be a short hop to winning the game. Did I ever get my book to you, by the way? I’m reading yours for the 2nd time. Great hearing from you after all these years. Are you and Linda settled in well on the northwest plains? I enjoyed our weekly experimental meetings here in the lab… but yes, it was time to get more into the spiritual (and literary) aspects of the research. No, I haven’t seen your book yet. I remember you were working on it before your move west. A lot of warm wishes to you both, from Regina and me. I am really happy that I found your site (my brother directed me). I have very quick question. Does sleep paralysis has anything to do with spirit world or it’s just a simple brain disorder? Thanks for this question, Kristina! I wasn’t aware of sleep paralysis. After some quick research, I’d venture to say, yes, it can be related to spirit. For one thing, I suspect that very often when the body is in any sort of paralysis state (sleep, hypnosis, coma…), the astral body, or spirit body, is somewhat detached from the physical body, exploring the astral surroundings near the physical location. So… in the case of “seeing” spirits in the room during sleep paralysis, I’d suspect that it’s the astral body that’s seeing them, and the information can make its way to the conscious mind the same way we remember dreams upon awakening. I plan to do some more research on this and write an article for this blog in the coming days. I was born and raised into a religion that my family belongs to. I followed that religion and study the believes until my late twenties. I am no longer an active member of the religion as I started to have so many questions about the purpose of this life, different religions/believes, death, afterlife, etc. However, while I was an active member of the church and by all the deep religious teachings/studies I had through out the years, I have to agree that there were many concepts I learned that make a lot of sense when reading your theories and research. For example, what you call “built-in Blinders”, in my family’s religion it is called the “Veil” – such as a veil that covers our conscious or memories of the “pre-existed life and spiritual world”. Also, over the years, I started to build up my own theory of the creation of the earth. Of the creation of this world. I believe that there are so many other planets and universes that are much more advanced than ours and that our planet was actually created by these more advanced living beings (or what other people might call “ETs”). I don’t believe in Darwin’s “Evolutionary Theory” or that the man is the evolution of the Ape Species. I believe that this world (the earth) was created by using the matter of other worlds/planets from other universes and the fossils of the Dinosaurs or the fossils that “link the evolution from ardipithecus to australopithecene to homo” are actually parts (fossils) of the matter of many different planets that were used to make the earth. I know that this might sound weird, but I have a strong believe that we, as spirits, actually develop from one stage (world) to the other. I believe that there some planets (worlds) that are inferior than ours and others that are extremely more advanced and that we might have born in different planets and universes and we progress from one world to another as we aim to achieve the higher stages. I believe in spirits as I have had my own “paranormal” experiences. And, as you mentioned in one of your articles, we have to be careful when wishing or calling for the spirits of our beloved ones. I believe that they are all around us, but in different dimensions. The synchrony between the physical and the spiritual world is different, and the contact experience can be very unpleasant (like the feeling of being possessed by a dark force/ or a shock). I would like to have your input to what I have just describe to you. I am facing a phase of my life which I question everything: the purpose of this life, what comes after it, the purpose of all different believes and religions… I have had many loses in my life which have left a deep sense of emptiness. I forgot to mentioned to you but I studied Clinical Psychology, so I am very familiar with all the mental disorders and illnesses. I agree with you that there are so many misconceptions regarding schizophrenia/Hallucinations… I do agree with you that these people suffering from hallucinations are actually more sensitive/ or have a closer connection with the other side. Or that their “blindness/veil” is thinner than a “normal person”, so they can see what we cannot see. They live between the worlds as in parallel and it can be very disturbing. I just need to have some assurance or hear some other opinions about the purpose of all of our suffering. I would like to know what other people think about the after life and to expect regarding being re-united to the people we learned to love and we lost. The sense of emptiness or lack of purpose is so depressing. It feels like I am living in a vacuum / dark blinded world. – Much of the natural life on Earth was engineered by intelligent beings from other worlds… something done either instead of or alongside darwinian evolution. – The veil / blinders that block our view of the spirit worlds around us. – Some people with finer senses can see beyond the veil. They might be inspired geniuses or psychic mediums or mystics or schizophrenics, depending largely on their disposition and the disposition of the spirits they interact with. So, to your main issue… What’s the real purpose of taking a lifetime on Earth and going through all the suffering this world has to dish out? Some people say Earth is the lowest density planet anywhere, which I think could be true. Some people say souls choose lifetimes on Earth as a learning experience, since the raw noble-savage lifestyles can’t be found anywhere else, which I also think might have some truth in it. But… my main view for the past 15 years or so has been that we (souls) choose lifetimes on Earth the way young men enlist in the military. The dense, low-vibration life here on the physical Earth is far removed from the finest realms of spirit of very high vibration close to the Source, where there’s perfect light and order. Out here on the fringes, the life energy from the Source gets so slow and dense that pockets of darkness and chaos form. The mission we choose at a soul level (I think) is to live a lifetime on Earth with the aim of spreading more light from the Source out into this noble-savage world… to battle against those pockets of darkness and chaos. We do that through our spiritual pursuits, and through our thoughts, words, and actions. The more we do that, the more we spread order into the farthest reaches of creation. That might be the main purpose of “The Project” that the ethereals told us about: To see how far out into the denser realms the perfect light from the Source can penetrate and maintain its integrity… before degrading into darkness and chaos. If that’s true, and if it’s true that Earth is at the very densest of the material realms, then we humans on Earth do indeed have a very important role in the overall scheme of things! Not always an easy life… but certainly an important one, at the soul level! I see you were asking for other opinions about the purpose of our life (and the suffering that’s bundled with it). I want to go ahead and chime in. The world we live in seems to be a very dark world. It’s a world where people tend to advance at the expense of others. It’s a world where we seem to be empty vessels. It’s a world where our spirit feels uncomfortable and trapped. I agree that it seems as if we are living in a “vacuum” of some sort. 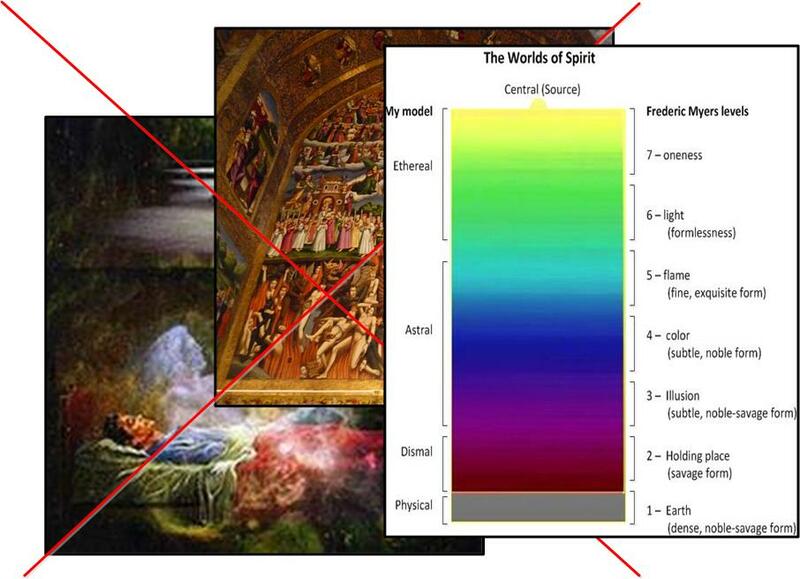 We’re on the fringes of the spiritual spectrum. It gets very messy out here, and it seems downright depressing, empty, shallow, terrifying and hopeless. If malicious intent and negative emotions were dangerous toxins and chemicals, I’d recommend wearing a hazmat suit for the entire duration of your stay on Planet Earth. Where do I believe we wind up after the expiration of our physical body? I’m still trying to figure it out, but I have to say that what we call the “afterlife” is indeed a place closer to “the light”. It’s a sort of cosmic existence. There are many different levels of existence, and we are the only ones who determine where our next location will be. A lot of Mark’s work (and his colleagues) has helped me to connect a lot of dots, and I believe that the experiences and research of ITC researchers around the world have revealed some important bits of information to help us realize who we really are. I’ve heard the phrase that we’re a “spirit going through a human experience”, and I think that could be true. I’ve never had a paranormal experience per se (I’m assuming you’re referring to the manifestation of ghostly entities), but I’ve had some very profound and special times where I felt like I was more than my physical body. They were special awarenesses – ones that transcended our 5 natural senses. If we’re constantly thinking in the back of our mind that we’ll be going to a better place after we’re done with our endeavors in this world, then odds are that we will be going to a place that is superior on a spiritual level to earth (and that’s actually most of the places that exist). I hope this helps, Viv! Thank you so much for your input. I agree that the Earth is a very dense/low vibration life source. I see the Earth as one of the dimensions that is probably one of the farthest from the light source/the core. And there are all kind of different level spirits that have chosen or have been placed to live in this world. Some are very high level spirits that have chosen to live here (or come back) to bring the light to the human beings that are in the darkness and some are very primitive spirits that still have a long journey of learning before reaching the next level. Some of the experiences I had were very pleasant while others were very unpleasant. When I was young and I was falling asleep (the stage between conscious and unconscious – when the line between the “reality and blinder block” is very thin) I would sometimes jump out of my bed for seeing a very dark/swamp like place. With spider coming down on my face. Or I would listen and see kids laughing and playing around me in a vey nice bright full garden. I knew I was not “hallucinating” because I could still hear or partially see my surrounding – as an example, I was seeing and listening all these kids laughing and playing araound my bed but at the same time I could hear my mother washing her face in the nearby bathroom. It was like I was in between 2 different dimensions. The latest experience I had was not very pleasant. It was father’s day and I was in the process of divorcing my ex-husband. He had come for dinner that night to celebrate father’s day with our son. But I felt very lonely and depressed when he left. My father died when I was 12 years old. And that night I really wished my father to still be alive and close to me. In the middle of the night I woke up to go to the kitchen to drink water, and I remember closing the kitchen door to keep my cats in there and not running around the house in the middle of the night. When I went back to bed (and I know I was still awake) I started to feel my comforter to “fluffy” like when the cats come on and start gently paddling the covers… I had felt that before but had gone out of the bed, as I was scared. But that night I decided to let it continue to see what would happen. I knew for sure that none of my cats were in the bed with me as I had just locked the kitchen door. So the fluffy on the covers continued and became more and more intense, to a point that I felt a very heavy presence on the top of me. All of a sudden I couldn’t move, hear, breath, or scream. I was completely dominated by a very powerful force. All I could do (and I did in desperation) was to start mentally praying for God to help me and then the force was gone. I know that it might have lasted seconds, but it was very scary and powerful. Now I wonder if it was my father that tried to make contact and “embrace” me as I was crying and calling for him, and because he is in a different dimension, the synchrony between the two worlds caused the experience to feel like a sleep paralyses/a electrical shock. Or if it were really some dark forces trying to suffocate me… I was so scared that once I was freed from the force, I jumped out of my bed and went to sleep with my then 9 year old son. I never had any other “encounters” after that. I just learned that I should accept that my father is gone and living in a different dimension and I should not disturb or be calling him. I know that we have all different of level beings living in the Earth and most of them have a lot to learn and grow in order to pass to a higher level. I just would like to know what are the plan for us, the purpose of being in this so dense and dark world. I sometimes feel jealous of my family for believing in their religion and knowing in their heart the purpose they have in this life. I wish I had found the answers for all my questions, but I am still searching for the purpose of my existence. I really appreciate that you two share lots of my own beliefs and I would like to continue learning and discussing your findings/researches/philosophy. I still have some questions that maybe you during your life time of study and research can help me have a better understanding. We know that the highest level spiritual beings are the ones closer to the light/ to the core. However there are other beings that are evil and have chosen to leave in the darkness. Why would some spirits fight to progress to the light? Who are these spirits that try to divert the work and positive influence of the beings of light? Will these spirits ever progress or there will be always a separation between good and evil? Maybe you can help me understand all the different levels/ dimensions which we travel through out our existence. From the very primitive level to the higher one. I believe we had many beings of light that came to live in the earth to bring the spirit of unity/brotherhood /love – like Jesus Christ / Gandhi / Buddha / Mother Theresa and many others. All these high level beings lived a very humble and simple live and all they did was to spread love with their teachings. However, there are still many evil forces pushing the humanity to commit monstrous and horrible things. Leading the humans to become selfish, aggressive, individualistic. All of these dark forces lead to war, prejudice, hate, disconnection. Exactly the opposite that the higher spirits have come to teach us. Why would some people let themselves get influenced by these negative forces? And why these evil spirits don’t want to progress to the higher levels? I know that I am asking a lot of questions, but I would like to have a better understanding on these different/opposite forces. This is certainly Mark’s area of expertise. In fact, everything that has inspired and influenced my current spiritual pathway actually began with my discovery of ITC, and http://www.worlditc.org. I have explored many other areas of spiritual development, but this one tends to make the most sense to me. I have so much to learn that it is overwhelming – but I know that I actually have a firm grip on the foundation of my spiritual development. I’m happy that Mark has this site, because it allows me to connect with people of like-mind, and it helps me to stay “on track”, so to speak. I feel like my learning has only just begun – it’s as if I have just read the introductory chapter in a very, very, very long and complex textbook. I now know the basic outline of things, but my learning needs to progress into the finer details. I hope this was worth sharing! Thank you so much for sharing with me your thoughts and refer the “Angels of Comfort” by Iasos. It was beautiful, peaceful, and calming. I agree with you that there is so much to learn. I also taking the first baby steps towards a more profound knowledge and soul searching. The teachings and philosophy of Mark Macy makes a lot of sense to my own beliefs. The many realms of existence / our extra-terrestrial inheritance. The extra-terrestrial inheritance explains the advanced civilizations we had in the past and the amazing constructions /buildings that were generated by these beings of higher knowledge. Without a very high tech knowledge, it would have been impossible to built the ancient structures such as the pyramids/ or a whole civilization like Machu-Picchu… It is amazing to finally find a site/blog that shares the beliefs I have developed through out my life time. But as you mentioned, there are still so many things to learn that can be overwhelming. I still have so many questions that I would like to find the answers. Why did the human beings lost the connection with the higher beings? Why were they exterminated from these planet? Why the planet earth was left in the darkness for so many centuries? After the mankind lost the contact with the higher beings, the dark age came and lasted for a long time. But it is amazing that in a matter of 100+ years, the earth slowly start o came out of the darkness and so many things were discovered and developed: the electricity/ the telecommunication/ the cars/ the cure for many diseases/ the machines / the computers… The world continue to grow more and more into higher technology. Does it mean that these higher advanced beings have come back to our civilization and help us get out of the chaos of darkness? Genius such as Benjamin Franklin, Thomas Edison, Albert Einstein, Albert Sabin, Alexander Fleming, Steve Jobs, Bill Gates, Carl Benz, and many others. It is amazing to see the progress of science and technology in the last century. I really appreciate your share and input. How are the souls generated/made/born? Is it our ultimately goal to reach the Etheral Realm? Or the Astral Realm? What happened after we reach the highest level? Are there more than one Universe, so the spirits that move/ grow from the Astral Realm can create their own Etheral/Core Realm and start a new kind of Universe / Life? I know that these are very deep/ profound questions, but I really would like to know if you might have some input to any of these questions. Souls emanate from the source (God, Brahma…)… like sparks from a 4th of July sparkler. We all have one of those sparks within us, so this illusory life on Earth is just the outer shell of our complete self. We are already, at this moment, living not just here on Earth but also in the astral and ethereal realms… at finer levels of our existence. When we die, we just cease to exist out here on teh illusory fringe. but we continue to live at finer levels. There are many material and astral and ethereal universes teeming with brilliant life… all spiinning off from the source..
What I’ve always wondered is if there are more than one source. Are there many Gods, all spinning countless universes? Or just the one God to whom we’re all connected? Hi I had a question about the astral planes…. You frequently mention Marduk and the third astral planes… are their many different 3rd level astral planes or is Marduk the only 3rd level astral plane where humans go when they die… are their more 3rd level astral planes besides just marduk and the river of eternity??? That’s a good question, Jason. Since most of our ITC communications came from “Marduk” and “Timestream” and the “River of Eternity” and the “Third Level,” these concepts tend to get kind of jumbled. There are many, many levels or vibrationally discrete universes in the omniverse, all superimposed like radio signals that are jumbled together in the air around us. I think it’s complex beyond what these material minds of ours can grasp, since we’re kind of locked-in to 5 senses streaming information about our material surroundings into our physical brain. It makes it hard to see the greater reality without some inner work that lifts us beyond the 5 senses and the brain. In order for a good spirit group like Timestream to communicate with us on Earth through ITC, it’s important that we all share a common view of life on both sides… their reality and our reality. That’s a big challenge because our limited view of the big picture here on our side. What is needed is some kind of model that simplifies infinity into something we can understand… and that’s where “third level” comes in. The River of Eternity encircles the astral planet Marduk, like a snake biting its own tail. I suspect that there might have been a massive river on the physical planet Marduk that also circled the entire planet… but of course that’s just conjecture on my part. Structures in an astral world are sometimes templates or subtle copies of structures that exist in a corresponding material world… so it would make sense that the late planet Marduk had such a river. Timestream is a sending station that sits along the banks of the River of Eternity on the astral world Marduk. Thanks, Jason, for giving me the opportunity to put this all into clearer perspective. I’ve got the information scattered around this site, but it’s nice to wrap it all up neatly in one place. Thanks for the reply Mark I really appreciate it that cleared up a-lot for me. I had another question… do you think the government or some other organization may secretly research ITC or other worldly research in a covert fashion??? Thank you very much, Viv, for sharing your experience with me. I’m feeling better that I’m not alone in this case. Hi Mark. I just started a blog of my own and would love to get your input on it, about it, or anything you might be able to add to make it more coherent. Thanks George. Most people can only imagine the things you and other homeless people have to go through. If you can keep going with the blog, I think it could open a lot of eyes. Maybe even help to move legislation to get more help to the poor. I like to keep in mind that life on Earth is just an illusion… not always an easy one or a pleasant one. There’s a better life in a brighter world awaiting everyone of good will. Meanwhile, I would love to see a Basic Income program adopted in the States, giving every adult about $1,000 a month. It’s the only way I can think of to be sure no American is left out in the cold. I was astonished, surprised and very glad to find your new website this evening! It seems we share some more interests than ITC. I will write more about this later. Good luck in your good work! Many years since our good times in INIT. I look forward very much to further dialog! Warm wishes to you and your family. I also have a more personal question to you. If you have a private email address, please tell me. I remember the fascinating afterlife reports from Maggy’s father, but I’m not sure if I saw them all (there might have been more published in Zoom). I agree that this is all valuable information, and should be made public.If Zoom has been posted online somewhere, I have not been able to find it. Anyway, my email is itcmark@gmail.com. Looking forward to hearing from you! I’ve been following your work for 11 years now, more or less, and I may be the only people in the world besides you and your fellow ITC contactees who’ve read everything you’ve posted on this subject of ITC, including reading all of the German translated pieces, despite their poor translation quality–still, invaluable, invaluable information. Sorry about the couple of grammatical typos above lol…and I’m a writer and editor! I just type too fast. Maggy was a very private person when I knew her. She and her husband avoided attention and publicity as long as I knew them, and they sought out collaborators only because of guidance from Technician and Timestream, who told the couple there had to be a unity among researchers before ITC could take the next big step. As I recall, “Zoom” was a short-lived publication, which I didn’t receive nor translate. I agree, this is amazingly important information! I’ve known of this work for many years, as I first heard of it from Hans Heckman who came to me over a number of years for Chiropractic Care. Recently I was relating some of what I learned from Hans to someone and decided to see what has transpired since my last contact with Hans. That search eventually led me to this site. I wonder if you could give me an update on Hans and Rita. I lost touch with them when they moved from Lansdowne. It’s been so long, I don’t imagine that they are still with us. I’ve always regretted not keeping in touch with them, I learned so much from them. So much of the information on this site is compliments of Hans, who translated all of the ITC contacts that came through in German (and by far most of them were in German) into English. He was a good friend, and it’s wonderful to hear from someone who helped him out along the way on his worldly journey! Thank-you so much, Mark! It was so good to read the article about Hans. Through Tanya, his granddaughter, I was able to reconnect with his daughter, Rita Marie, who I had also taken care of. She mentioned that you may possibly start working with Hans. If so, please keep me in the loop. That would be awesome. Pat, I’m glad you’ve gotten to know some of Hans’s family, a pleasure I never had. I’m not working on an active ITC bridge at the moment. It would be wonderful to be on contact with Hans, and with our mutual friend George Meek, and if that happens (they’ve got my phone number 🙂 ), I’ll certainly post all the details here on this blog. Best wishes in your practice……. Thanks for the link and background. Best of success with your experiments! I hope you are well. I’m wondering if you ever still speak on ITC? We have a conference coming up…. No, I haven’t given public presentations for a number of years. The readers might be interested……..
Hello Mark, I was in communication with you about 20 years ago through your ITC web site. One of the pictures that I found so fascinating was one of a planet close to earth in another dimension. I was reminded of this when I read a science article on the theory of a multi-deme signal universe. It even suggested there are other Suns and planets occupying the same space but in a different dimension. I was looking for that particular photo but could not find it. Would it be possible to send me a copy? I vaguely recall that image (and the image was also kind of vague, as I recall 🙂 ),,, but I don’t seem to have that image in my files, sorry to say. It was originally published in one of Maggy’s CETL Infonews issues, I believe. Thanks for the link, which readers may find useful. I’m not on Facebook anymore, but thanks for the invitation. After several years of intensive research regarding all things afterlife finding you on YouTube left me in shock for a couple of days because it was so absolute for me. I knew and know what you are passing on is truth. I can’t believe that such staggering information you have gotten is hardly talked about or viewed in mainstream I can only conclude that maybe people will only beleive what they want to however much evidence you have. I pass on your name all the time but most are in disbelief (I think). I get lots of electrical communication through an old laptop it stops on certain words and lately on 2s its amazing how dates will add up to 22 or bhe 22 or there will be 222. I’ve been filming it now but realise people will only think I am controlling my laptop somehow and thats another thing the laptop starts when I ask it to. I can’t thank you enough for the work you do. Thanks Kate, that means a lot to me. I think humanity will awaken spiritually when the time’s right. I suppose the best that people like me can do is just to gather up the best ideas and evidence and truths, and put it all out there for anyone who’s ready. That is most uplifting to me, to read that text above from you. Now, please tell me what is your concept of luck, like as you put it above, “Thanks to good luck.” What about bad luck? I am most keen to read what you have to tell mankind what is luck. … I’m more in the “prescriptive” luck camp, thinking that most of our fortunes, for better are worse, are choreographed by spiritual forces. Not just ethereal beings, spirit guides, and other invisibles, but also the force of karma, or spiritual consequences for our thoughts, words, and actions mostly in this lifetime, but also carried over from other lifetimes. That’s the short version, but I’m sure the subject deserves a lot more reflection. What’s your view on luck?